Cut 3 medium-ripe hass avocados (about 8 ounces each) in half. Twist the halves to separate them and remove the pit with the tip of the knife. Place an avocado half, cut side up, in your palm and make 3 or 4 evenly spaced lengthwise cuts through its flesh down to the skin, without cutting through the skin. Make 4 crosswise cuts in the same fashion. 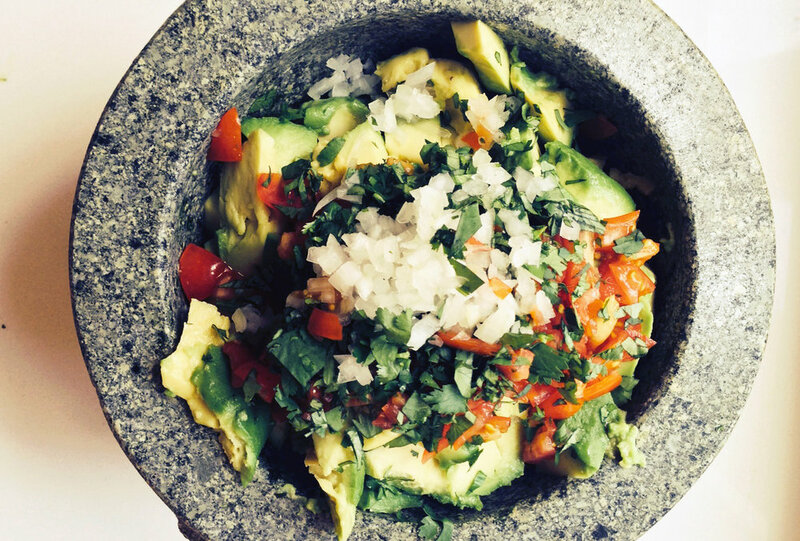 Scoop the diced avocado flesh into the mortar and pestal. Repeat with remaining avocado halves. Gently fold the avocado into the chile–onion paste, keeping the avocado pieces fairly intact. Add 3 tbsp. diced tomato, 2 firmly packed tbsp. chopped fresh cilantro, and 1 tbsp. finely chopped white onion. Fold together all the ingredients. Taste and add salt, if necessary. Serve immediately, directly from the mortar and pestle (or bowl), with tortilla chips.